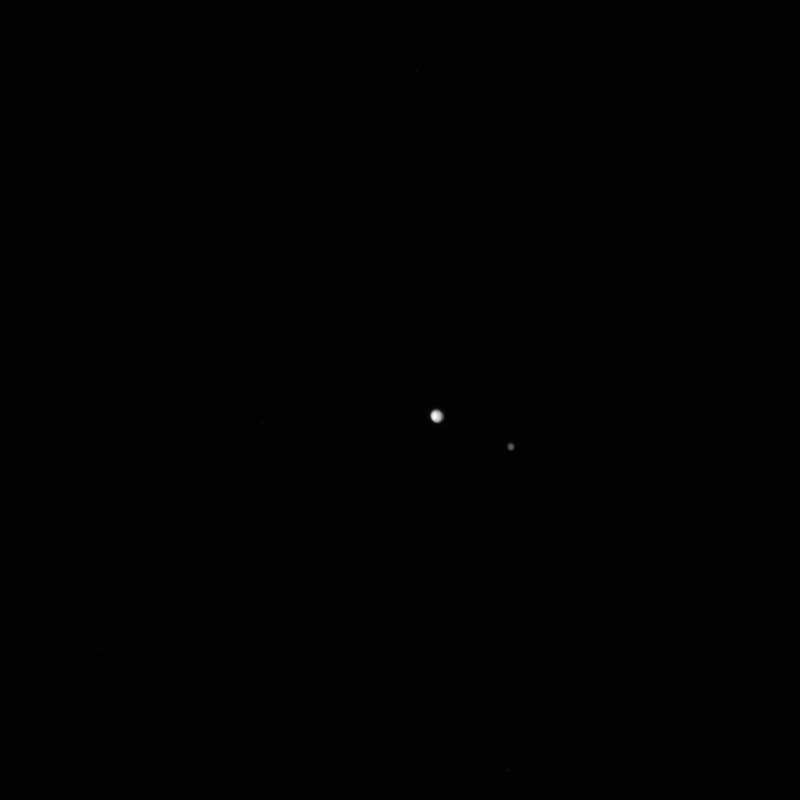 Pluto and Charon from 27.7 million kilometers, at 2015-06-21 04:59:45 UTC. 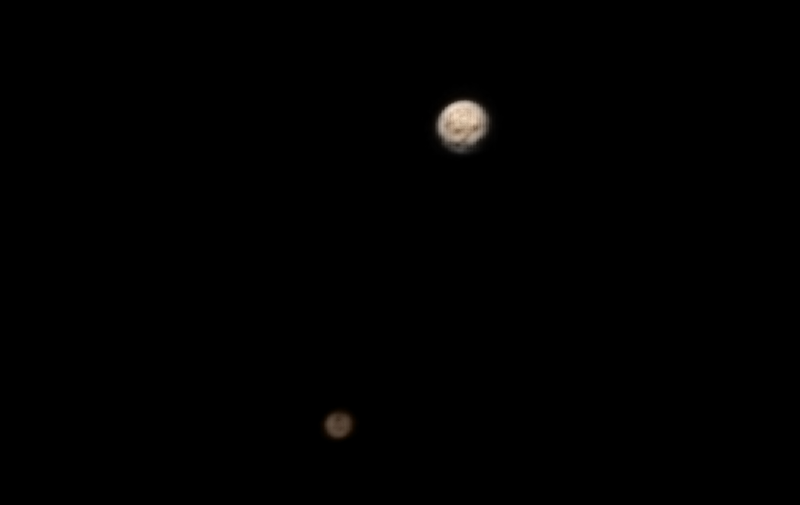 Tonight I was browsing the latest raw images of Pluto and Charon taken by New Horizons today from only 27.7 million kilometers away and I realized that when you zoom in, Charon is just beginning to get big enough to hint at brighter and darker areas on the surface. The raw images, however, are in JPEG format, compressed and lower resolution than the processed data the team is reviewing (I learned this recently from the super knowledgeable Emily Lakdawalla; you must follow her on Twitter.) This gives the science team time to be the first to make major discoveries while still satisfying the public’s interest in seeing the latest images as quickly as possible. That doesn’t mean the team isn’t periodically releasing higher resolution images for all the world to see. The image below is one example of that, apparently shared today on an online forum by Alan Stern, the Principal Investigator of the New Horizons mission. Enthusiasts are working with these raw images to try to pull out additional detail. This is the point in the mission where the geologists and other experts and amateurs alike can really start getting excited. The surface features are beginning to pop out in this processed color image, the result of combining several black and white images with an older color image. Sure, it’s not clear exactly what we are looking at, but that is all part of the fun. As New Horizons speeds toward its close flyby of Pluto on July 14, every day should now start revealing something new and unexpected. Charon is darker and more red in color, with what looks like an obvious dark patch. At this scale, though, a single pixel is, what, tens or hundreds of kilometers across? All that area of terrain collapses into a single pixel, resulting in an average that at this point in time can only be a hint about what is actually there. Anyway, Pluto and Charon are, in fact, no longer just bright (but faint) dots in the sky, but actual worlds with surfaces. Dynamic, colorful, variable surfaces. The coming days are going to be extraordinary. Welcome to Pluto and its moons!